So Dragon Ball can be pretty safely described as being “a thing” once again. The current arc of the newest incarnation of the series, Dragon Ball Super, has taken the stakes about as high as a work of fiction can raise them with the whole wiping out universes plot device. Meanwhile, critical reception of the most recent console games to hit North America (Dragon Ball Xenoverse and its sequel) was somewhat mixed but their financial reception was decidedly positive. Dragon Ball is back in the cultural consciousness in a big way, and while Japan received a Hearthstone-esque card battler called Dragon Ball Heroes: Ultimate Mission X last year, any and all buzz on this continent has been rightly directed toward Arc System Works’ upcoming Dragon Ball FighterZ. It’s easy to see why. Longtime fans of the series who have fond memories of the Budokai games have been in need of a solid fighter since at least 2011’s Ultimate Tenkaichi. However, there seems to be more than just nostalgia at work here. Arc System Works is primarily known for two series: Guilty Gear (an anime-inspired 2-D fighting game) and BlazBlue (an anime-inspired 2-D fighting game) which emphasize fast-paced action and over-the-top combos, often including an emphasis on strong mid-air play. This may be a somewhat simplistic view, but that combination makes so much sense for a Dragon Ball game that it’s difficult to explain why it took this long to happen. The most encouraging development for me, however, is how Arc System Works have addressed a constant problem with licensed fighting games: how do you account for characters who canonically should not be able to fight with the rest of the roster on equal footing? Usually this problem is simply hand waved away. Previous Dragon Ball titles have ranged from trying to balance everyone in at least some way (playing some random Frieza soldier as a main was a valid tactic at times) to showing incremental differences in total strength but still theoretically allowing weaker fighters like Hercule to defeat a super saiyan (as was the case in the Xenoverse games). Admittedly, this isn’t much to complain about. Fans of fighting games get a reasonably balanced product, and fans of Dragon Ball get to laugh at the implausibility of Yamcha somehow defeating literally anyone else on the roster. But by implementing varied game mechanics FighterZ is looking to turn this from a comical subversion into a compelling feature. One of the themes of Dragon Ball Z was that estimating an opponent on the basis of their strength alone is not sufficient, and that other factors besides apparent strength could determine the outcome of a fight. This is why the infamous “Over 9000!” scene existed. It set a precedent going forward for the series that a character was more than just whatever number appeared next to them on a scouter. In FighterZ, canonically underpowered characters are treated as opportunities to implement something new rather than mandatory baggage to fill out the roster. With that said, let’s take a look at the roster this game will be toting at launch. It’s mostly what fans of the series would hope for. Mainstays like Goku, Vegeta, and Gohan are present, the three most significant villains from Dragon Ball Z appear in the form of Frieza, Cell, and Majin Buu, and there are even some fan favorites from Dragon Ball Super like Beerus and Hit. Now let’s look a little further down the list. Nappa has the ability to plant self-destructing Saibamen to hinder his foes, while Yamcha’s attacks are about as weak as they should be in exchange for being quick. Android 17 appears as an assist for his sister Android 18. Tien gets a similar boost from his ally and training partner Chiaotzu, who can help Tien set up combos. Captain Ginyu is here somehow, and has the androids and the crane school beaten with the ability to call in assists from his four comrades in the Ginyu Force. Captain Ginyu also has his signature party trick in the form of a body change ability. Not only does the Ginyu player take control of their opponents’ character, the opponent must now play the remainder of the match as Ginyu at whatever health level he had when the switch was made. One shudders to imagine the salt and rage which will emerge online when an enterprising Ginyu player turns a match around at the last moment with this ability. 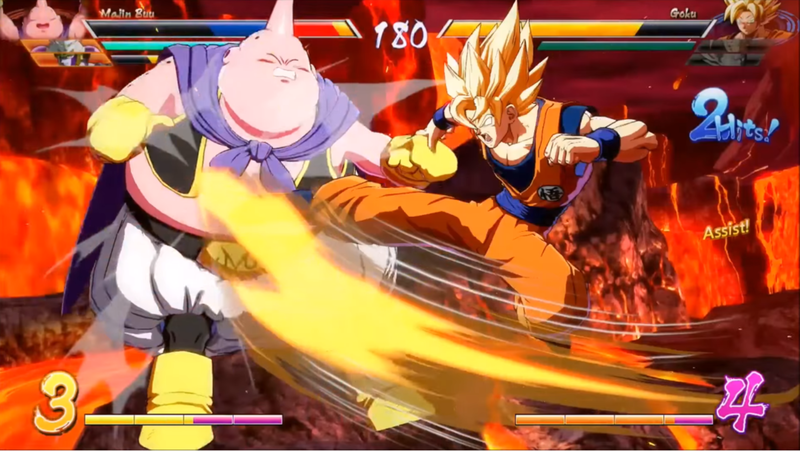 The gameplay of FighterZ also looks to make multiple competitive playstyles viable to fans of other fighting games who may not necessarily have experienced Dragon Ball before. Fans of Street Fighter may even see some parallels between their favorite series and this one. Android 16 plays as a Zangief-like grappler with detachable hands. Piccolo’s ability to stretch his limbs has been extrapolated into a Dhalsim-inspired long-distance zoner. Most impressive is how Arc System Works have dealt with the problem of super saiyan blue. On paper, this is a form attainable by Goku and Vegeta which would make them several times more powerful than nearly every other character in the game. Here, the blue versions of those two characters essentially play the same way as Akuma, with very high damage given and equally high damage received. So what do you think? How justified is the hype around FighterZ? Does it look like the deep, fun fighting game it needs to be, or is this just a cynical cash grab by people who know what they’re making will sell to certain consumers regardless of quality? Sound off in the comments, but please be respectful. Dragon Ball FighterZ is out January 26, 2018 for Xbox One, PS4, and PC.